Has Congress virtually decimated itself in Andhra and Telangana? 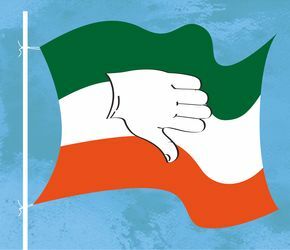 In a letter full of angst and agony, a senior leader of the Sonia Congress in Andhra Pradesh declared last week that, “The Congress organisation in Andhra Pradesh has suffered a multi-organ failure and is on life support.” A five-term Congress member of Parliament, the highly talented and well regarded Kishore Chandra Deo believes that the party is “in a state of coma… is literally extinct there and the leadership is not concerned”. Deo is not just any ordinary member of the Congress. A tribal ‘zamindar’ educated at the prestigious Madras Christian College, Deo’s name figured on every short-list of potential members of the Manmohan Singh ministry until he was finally inducted in 2011. Deo deserved better than being merely a minister for tribal affairs and panchayati raj. It was a comment on the state of affairs within the Andhra Congress that his talents were never better utilised. For him to now make bold to declare the virtual death of a party to which he always belonged is testimony to the crisis facing the party in Andhra Pradesh, following its ignominious defeat in the recent assembly elections in Telangana, where Congressmen are leaving the party to join the ruling Telangana Rashtra Samiti. Clearly, the Sonia Congress has not yet recovered from the consequences of its ham-handed handling of the bifurcation of the erstwhile united state of Andhra Pradesh and continues to be rejected by Telugus on both sides of the divide. That this should be the fate of a party that once counted the Telugus among its most loyal voters is a statement on the larger crisis facing the party, despite its recent victories in state assembly elections. Coastal Andhra was a region in which the original Indian National Congress had struck deep roots and despite the challenge posed by the Communist and Swatantra parties, the Congress held its own in the region under the leadership of such stalwarts as Bezawada Gopala Reddy, Damodaram Sanjivayya and Kasu Brahmananda Reddy. Till N.T. Rama Rao’s historic mobilisation against the Congress in 1981 the party faced no competition at all. My familiarity with the kind of roots the original Congress party had struck in the Andhra region owes at least partly to the tales one heard from relatives who were active members of the Congress. My great grand uncle, Baru Raja Rao, a Congress volunteer at Ananda Bhavan in Allahabad, played host to Panditji when he visited Rajahmundry and stayed at Rao’s home. After independence, my father worked closely with Congress chief ministers including Brahmananda Reddy, P.V. Narasimha Rao, M. Chenna Reddy, Jalagam Vengala Rao and N. Janardhana Reddy. During those years the Congress seemed to be the natural party of government in the state. United Andhra Pradesh was a strong bastion of Congress support during the tenure of the United Progressive Alliance. It is, therefore, shocking to see the Congress virtually decimate itself in both Andhra and Telangana. What explains this sorry state of affairs? Deo blamed both the party’s national leadership, especially party president Rahul Gandhi, and the state’s present rootless and self-styled leaders for this denouement. Rahul’s decision to ally with Telugu Desam’s Chandrababu Naidu helped further weaken the party’s already tenuous hold on the state, given Naidu’s declining popularity. The precipitous decline of the Congress in Andhra and Telangana seems to mimic the fate that befell the party in Uttar Pradesh, Bihar, West Bengal, Tamil Nadu and Odisha. A sudden implosion following years of decay.